DR485 was successfully added to your cart! DR485 could not be added as a favorite. Please make sure you are logged in. 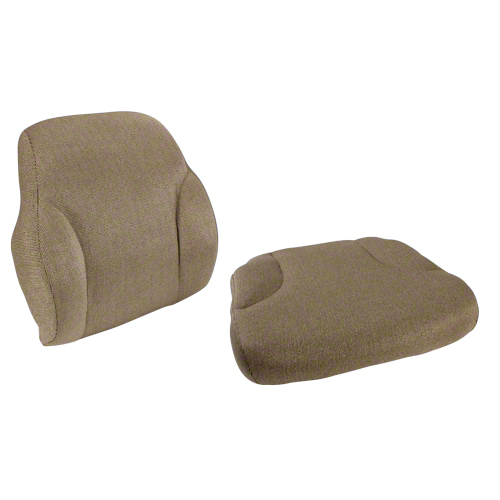 Bottom and backrest cushion set for air suspension seats (will not replace Active-Seat™). Brown fabric over foam cushion mounted on steel backing. Fits John Deere tractors (wheel & track) 7130 Premium, 7230 Premium, 7330 Premium, 7430 Premium, 7530 Premium, 7630, 7720, 7730, 7820, 7830, 7920, 7930, 8110, 8120, 8130, 8210, 8220, 8230, 8310, 8320, 8330, 8410, 8420; 8430 (06-09); 8520, 8530; late 9100, 9200, 9300, 9400 s/n 30001 and up; 9120, 9220, 9230, 9330, 9420, 9430, 9520, 9530, 9620, 9630.